In the previous two posts I discussed mostly about the philosophy and attitude of developing with testing. In this post I give some tips and tools examples for testing. There’s also TestNG, which is great tool. But I have much more experience with JUnit so I will describe this framework. 1. Use the latest version. 2. Know your testing tool! The most common out-of-the-box rule, is the TemporaryFolder Rule. It lets you use the file system without worrying about opening and closing files. An example of Rules can be found here. Really cool tool. It lets you run the same test with different input and different expected output. It might be abused and make a atest unreadable. This library is “extension” of JUnit. Hamcrest library gives us out-of-the-box matchers. Matchers are used with the assertThat(...,Matcher) flavor. I almost always use this flavor. You can verify existing objects in collection ignoring order. You can check greater than. The test is more readable using the assertThat + matcher. You can create your own Matcher. It’s very easy. This is the second library I can’t work without. It lets you mock dependencies of the class under test. Using mockito you mock dependency. Then you “tell” the mock object how to behave in certain inputs. You tell it what to return if some input entered. You can verify input arguments to a called method. You can check the order of method / mocks calls. These two are very useful when working with legacy code. They allow you to test private methods, static methods and more things that you normally can’t. I think that if you need them, then something is wrong with the design. However, sometimes you use external libraries with singletons and/or static methods. Sometimes you work on legacy code, which is not well suited for testing. 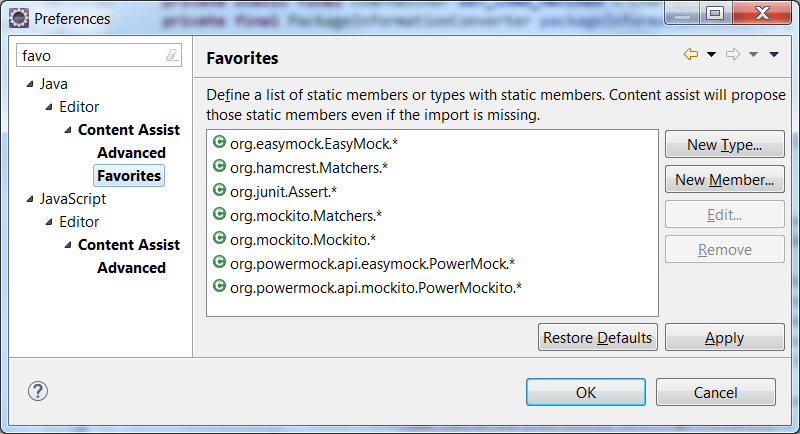 JUnit, mockito, hamcrest are used for unit tests. JBehave is not exactly the same. You write stories which are backed up by code (Java) and then you run them. JBehave can be used for higher level tests, like functional tests. Using JBehave, it’s easier to test a flow in the system. It follows the Given, When, Then sequence. If you take it to the next step, it can be a great tool for communication. The product owner can write the scenarios, and if all is green, by the end of the iteration, then we passed the definition of done. cucumber is another BDD tool. In order to have testable code, among other things, you need to practice DI (dependency injection). If you instantiate a dependency in a constructor (or method) of a class under test, then how can you mock it? If you can’t mock the dependency, then you are bound to it. And you can’t simulate different cases. Many application have Spring as the DI container, but less developers take the advantage of using the injection for testing. Use SONAR in your CI environment. Check code coverage using cobertura or other tools. Use Jenkins / Hudson / Other CI tool for automation. Your IDE can help you writing tests. MoreUnit is cool plugin that helps writing tests faster. In eclipse, CTRL+Space can give you hints and fill imports. But not static imports. Most (all?) libraries use static imports. So you can add the testing libraries as favorites and then eclipse will fill them for you. Here’s part of POM for testing libraries. You can use profiles to separate unit testing with integration tests. This is the second post of the series about testing. In the first part I explained about the mindset we need to have while developing with tests. Or, in better words, developing for testable code. In this part I will cover some techniques for testing approach. The techniques I will describe can be seen as how to transform the mindset into actions. Types of tests are layers of what we test. The most obvious one is the unit test. Using JUnit (or TestNG, or any other tool), you will test the behavior of your code. Each test should check one behavior of the class/method under test. Another layer of tests, which usually done by developers, is what I like to call integration tests. This type of test will usually be part of the code (under the test directory). Integration tests may test several classes together. They may test partial flow. I like to test Spring wiring, verifying that the context file is correct. For example, if I have injected list of beans and the order is important. Testing the wiring can be considered as integration test. Another example would be checking the integration of a DAO class and the class that uses it. Sometimes there are “surprises” in these parts. As a higher degree of tests, you will want to test request and response (REST). If you have GUI, make an automated test suit for that as well. Automate your full development cycle. Add your JUnit, selenium, JMeter, JBehave to your CI environment. 1. CI that checks the SCM for changes and runs whenever there is a change. 2. Nightly (or every few hours). A slower automation test suit that check more stuff, like integration tests. The nightly can be slower. If you do continuous deployment, then your setup may be different. Have dedicated environment for testing. DB that can be cleared and refilled. If you work on REST service, have a server just for your test and automation environment. If you can, try making it as similar as possible to production environment. There are frameworks for stubbing and mocking. But first understand what it means. There’s a slight difference between stubbing and mocking. Basically they both fake a real object (or interface). You can tell the fake object to behave as you want in certain input. You could also verify that it was called with expected parameters. You can fake DB, or you can use some kind of embedded database. Embedded database helps you isolate tests that include DB. Same thing for external services. How many times you couldn’t tell what went wrong because there was no message? The failing test was assertTrue(something), Without the message parameter. Don’t be afraid to have test-methods with (very) long name. It really helps when the test fails. But whatever you like to name your tests, try to follow some convention for all tests. It is also the part where you tell your mocks (more about it next post) how to behave. When is the part where you run the tested code. Then is where you check the result using assertions. It’s the part where you verify that methods were called. Or not. If it’s hard to keep an orderly structure, then consider it as test-smell (see previous post). A unit test of class should run 1-5 seconds. Not more. You want the quickest feedback whether something failed. You will also want to run the unit tests as many times as possible. If a test for one class takes around 30-60 seconds, then usually we won’t run it. Running a full test suit on all your project should not take more than a few minutes (more than 5 is too much). Tests should coverage all your production code. Coverage helps spot code which is not tested. If it’s hard to cover some code, for instance due to many code branches (if-else), then again, you have test smell. If you practice TDD, then you automatically have very high coverage. Important: Do not make code coverage as the goal. Code coverage is a tool. Use it. In this post I gave some more ways, more concrete, on how to approach development with tests. In the following post I will give some pointers and tips on how to work with the available tools. This post is the first of a series of three. Testing code is something that needs to be learned. It takes time to absorb how to do it well. It’s a craft that one should always practice and improve. Back in the old days, developers did not test, they checked their code. Today we have many tools and techniques to work with. But I believe that testing starts with the mind. State of mind. Should I really answer that? Tests are your code harness and security for quality. Tests tell the story of your code. They prove that something works. They give immediate feedback if something went wrong. Working with tests correctly makes you more efficient and effective. You debug less and probably have less bugs, therefore you have more time to do actual work. Your design will be better (more about it later) and maintainable. You feel confident changing your code (refactor). More about it later. It reduces stress, as you are more confident with your code. Perhaps you will skip the lowest parts of your system. The parts that reads/writes to the file system or the DB or communicate some external service. But even these parts can be tested. And they should. In following blogs I will describe some techniques how to do that. Test even the smallest thing. For example, if you have a DTO and you decide that a certain field will be initialized with some value, then make a test that only instantiate this class and then verify (assert) the expected value. This is how I like to refer to the point that a test needs to check one thing. If it’s a unit test, then it should test one behavior of your method / class. Different behavior should be tested in a different test. If it’s a higher level of test (integration, functional, UI), then the same principle applies. Test one flow of the system. Test adding elements to DB correctly, but not deleting in the same test. Isolated test helps us understand exactly what went wrong. Developing isolated test helps us concentrate on one problem at a time. One aspect of isolation is related to the SRP. When you test something, isolate the tested code from other part (dependencies). That way you test only that part of the code. If the test fails, you know were it was. If you have many dependencies in the test, it is much harder to understand what the actual cause of failure was. But isolation means other things as well. It means that no test would interfere another. It means that the running order of the tests doesn’t matter. For a unit test, it means that you don’t need a DB running (or internet connection for that matter). It means that you can run your tests concurrently without one interfere the other (maven allows exactly this). If you can’t do it (example: DB issues), then your tests are not isolated. If it is too complicated to setup environment for the test, then probably the unit being tested has too many dependencies. If after running a method under test, you need to verify many aspects (verify, assert, etc. ), the method probably does too much. Usually a really complicated test code means less structured production code. I usually see correlation between complicated test and code that doesn’t follow the SRP, or any other DOLID principles. In my experience, thinking always on how to create testable code, yields much better design. The code “magically” has more patterns, less duplication, better OOD and behaves SOLIDly. Forcing yourself to constantly test your code, makes you think. It helps divide big, complicated problem into many (or few) smaller, more trivial ones. If your code is testable and tested, you have more confident on it. Confident on the behavior and confident to change it. Refactor it. This item can be part of the why. It can be also part of the techniques. But I decided to give it special attention. Refactoring is part of the TDD cycle (but not only). When you have tests, you can be confident doing refactoring. I think that you need to “think about refactoring” while developing. Similar to “think how to produce testable code”. When thinking refactoring, testing comes along. This was the first post of a series of posts about testing. The following post will be about some techniques and approaches for testing. I am working on a presentation about the ‘Single Responsibility Principle’, based on my previous post. It take most of my time. In the meantime, I want to share a sample code of how I use to test inner fields in my classes. I am doing it for a special case of testing, which is more of an integration test. In the standard unit testing of the dependent class, I am using mocks of the dependencies. One approach would be to wire everything and then run some kind of integration test of the logic. I don’t want to do this. It will make the test hard to maintain. The other approach is to check wiring directly. And for that I am using reflection. Below is a sample code of the testing method, and the usage. Notice how I am catching the exception and throws a RuntimeException in case there is a problem. This way, I have cleaner tested code. On a previous post, I introduced a system requirement of validating and filtering a request by setting flags on it. In this post I want to show the filtering system. 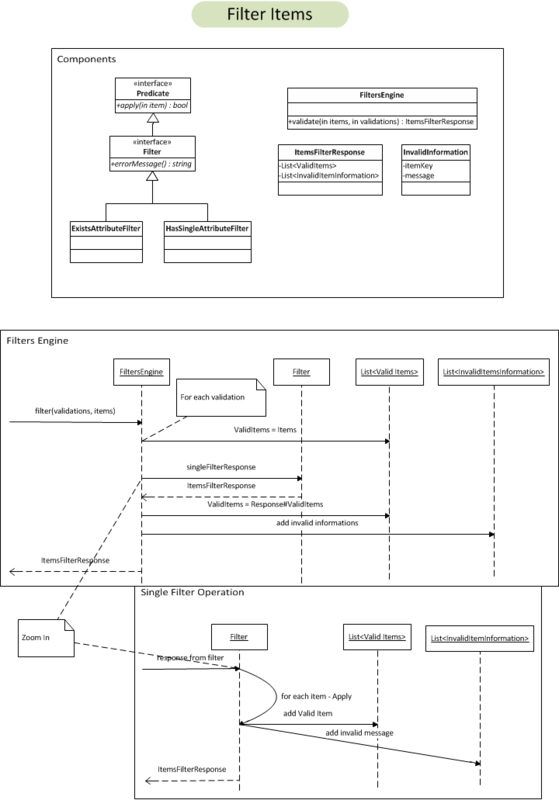 Here are general UML diagrams of the filtering components and sequence. FilterEngine is a cool part, which takes several Filters and apply to each the items. Below you can see the code of it. Above, the sequence diagram shows how it’s done. You can see that I don’t care about the implementation of Filter. Actually, I don’t even have any implementation of it. I also don’t have implementation of the Item nor the request. Try to see whether it is ‘clean’. Can you understand the story of the code? Can you tell what the code does by reading it line by line? On the following post I will show how I applied the flag mapping to select the correct filters for a request. [Edit] Created tag Filtering_an_item before refactoring. We are working on a service that should accept some kind of request. The request has List of Items. In the response we need to tell the client whether the request is valid and also some information about each item: is it valid or not. If it’s valid, it will be persisted. If it’s not, it should be filtered out. So the response can have information of how many items are valid (and sent to be persisted) and list of information of the filtered out items. The request has another metadata in it. It has collection (set) of flags. 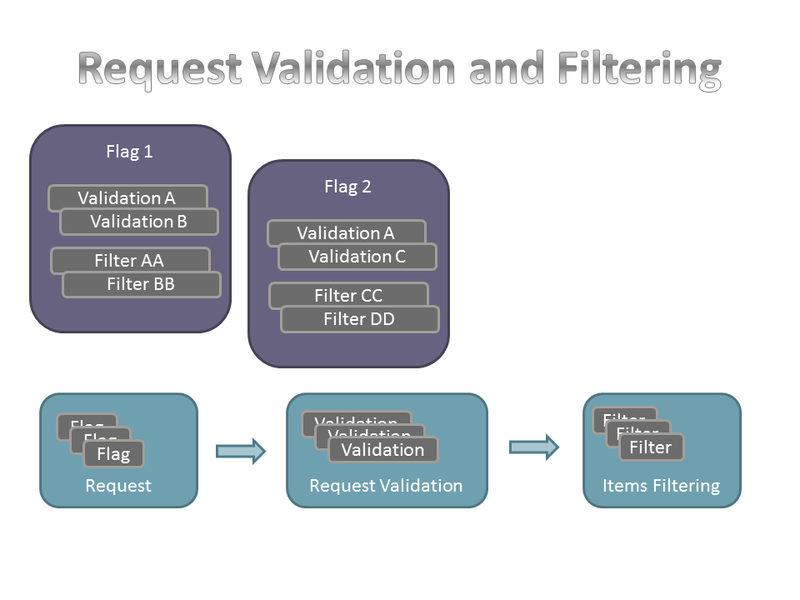 The filtering and validation is based on the flags of the request. So basically one request may be validated and filtered differently than the other, based on the flags of each request. We might have general validations / filters that need to be applied to any request, whatever flags it has. We’ll hold a mapping of flag-to-filters, and flag-to-validation. We have a basic request already, as the service is up and running, but we don’t have any infrastructure for flags, flag-mapping, validation and filtering. We’ll work bottom up; create the mechanism for filtering, enhance the request and then wire it up using Spring. I’ll try to show the code using tests, and the development using some kind of TDD approach. I am using eclipse’s EclEmma for coverage. By looking at the code, you can see usage of JUnit, Mockito, Hamcrest, Google-Guava. You can also see small classes, and interface development approach.